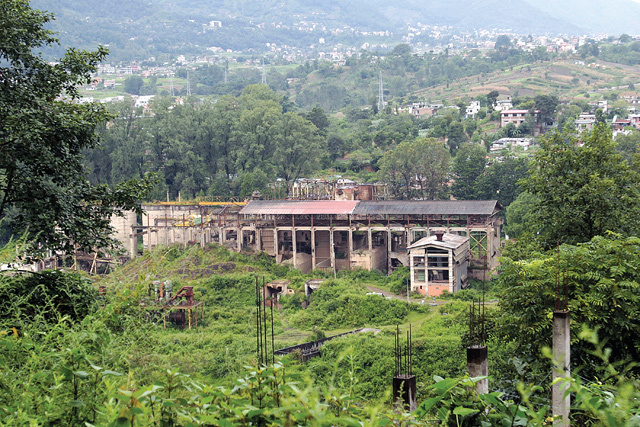 MONUMENT TO DECAY: The ruins of the abandoned cement factory at Chobhar is testimony to the chronic state neglect of the industrial sector over the past two decades of democracy. Prithvi Narayan Shah built the imposing fortress palace in Nuwakot in 1762 as he swept eastwards towards Kathmandu Valley as part of the conquests that led to the formation of the nation state of Nepal. Just like the Malla palaces of the Valley, the Nuwakot palace signified prosperity, and was a symbol of a promising culture. King Prithvi Naryan’s other purpose of keeping the Nuwakot Palace was to guard the trade route to Tibet via Rasuwa and Kerung. It is interesting that after the earthquake and landslides damaged the Kodari Highway, Nepal’s link to Tibet and China has reverted to this ancient route. The fact that nearly three centuries ago, Nepal had a strong economy that thrived on trade with its neighbours means that we have a history of entrepreneurship and private investment. You don’t trade unless you have something to sell, or buy. Yet, in the modern era Nepal’s first private enterprise was only registered in 1925 by which time Michigan University had already launched its first course in entrepreneurship. Somewhere along the way, we got lost in fostering private businesses. We abandoned the heritage of trade that once made Nepal a vibrant entrepôt. Kathmandu’s Asan and Indrachok specialized in trade. Somehow the politics of the past six decades did not foster business. And that lapse has led to the lack of jobs and is the prime reason behind the outmigration of Nepalis to India, Malaysia, and the Gulf, for work. During the Rana regime, we forgot to lay the foundations of private business, and institutionalising the process of entrepreneurship. And in the past 60 years, trade came to be synonymous with smuggling. Nepal became a convenient place for trafficking goods destined for the protected Indian market. Successive regimes became complicit in this.Promoting the domestic industry was just not the priority. With the rate of return from smuggling so high, and with the prospect of raking in profits overnight, there was no incentive to invest in manufacturing and industries that would create jobs. The gestation period was just too long. By the time Nepal was registering its first private limited company others nations in the neighbourhood were already industrialised. Businesses had no staying power. Public sector companies, many set up with foreign assistance, were allowed to decay. It’s not that individual Nepalis do not know business. Every time a highway is blocked by landslides, traders immediately take the opportunity to sell bottled water and food to stranded passengers. In Kathmandu Valley alone there are supposed to be 55,000 grocery stores. But when we check, we find many haven’t really expanded. Nepalis are entrepreneurs, we just don’t seem to have the skills to sustain businesses, and make them grow. Nepal’s history of industrial development is short. In 1936, after the formulation of the Nepal Companies Act, the Biratnagar Jute Mills was established as the first joint-venture industry. A few more government-owned industries were opened in the 1950s and 60s, often with support from China and the then USSR. By 1986, there were 2,054 industrial establishments employing about 125,000 workers. 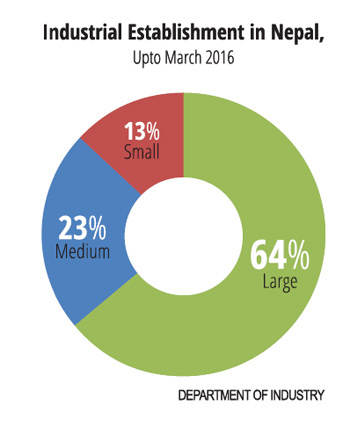 And today there are 6,328 industries of which 13 per cent are large scale, 23 per cent are medium scale, and 64 per cent are small scale enterprises. Together, they employ about 512,000 people with nearly half of them in the big factories. This is the opposite of the rest of the world where small and medium-scale enterprises provide a bulk of the employment. Analysing the entrepreneurial ecosystem in Nepal we see that most industries have a short lifespan. Many would-be entrepreneurs lack planning and do not have a proper business plans, or strategies. Moreover, they face constant legal and political hurdles which affect business operations. This has not only made difficult it to sustain businesses, but has also discouraged many aspiring entrepreneurs. Lately, there is a realisation that only by reviving the traditional entrepreneurship of our forebears and providing incentives to investors will Nepal be able to generate new jobs and stop the outmigration of its population. That presupposes a visionary government with a long-term strategy. Parties unleash students to put pressure on the king.